Intentional Family: Field trip. 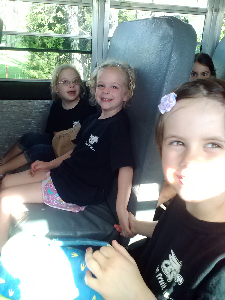 On a bus! Field trip. On a bus! My class is going on a field trip today. And we get to ride the big bus from the high school!! I love riding a bus so much! This is me and two of my friends. Both their names begin with A. I say they are awesome! Been playing catch-up today on your blog! My favorite was the Christmas photo. Beautiful girls, beautiful dresses! Happy Belated Birthday and Heart Day! For Mrs. E. My memory verse.